Conflicker is turning out be very mysterious. Everyone is looking out for its whereabouts. It is assumed that it may be originated from China. But it is not sure. Be very much aware about your machine and try to protect it from conflicker. Here is some more detail to find out its presence on the machine & how to eradicate it. There’s been a lot of fuss about theÂ Conficker worm. And here’s the a $250,000 question: what is the origin of the virus? $250,000 is the amount of moneyÂ Microsoft is putting up as a reward for any information leading to an arrest related to the case. Folks atÂ BKIS, a Vietnamese security firm that makes theÂ BKAV antivirus software, announced Monday that they found clues that the virus may have originated in China. Previously, there were rumors that it might have been from Russia or Europe. Conficker is a very sophisticated worm that took advantage of aÂ security hole mentioned in this Microsoft bulletin. The hole affected all 32-bit and 64-bit Windows operating systems, even those with the latest service packs. 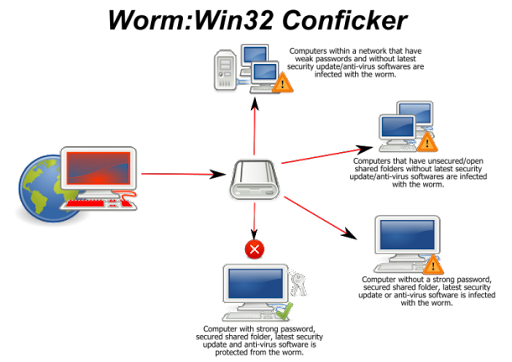 The hole allowed the virus to infect the computer without any user interaction via the Internet, local network, or USB thumbdrives. Once infected, it stops the computer’s security services and Windows update service, and disables tools and software designed to remove it. The worm also allows the creator to remotely install other malicious codes on the infected computer.